Some of the best diving in the Caribbean can be found in the waters surrounding Roatan and the Bay Islands. The world’s second largest barrier reef backs onto the island’s coastline making Roatan one of the world’s top diving destinations. And did you know that Roatan diving courses are some of the cheapest in the world? Located at the southern terminus of the Mesoamerican Barrier Reef System and skirting the Cayman Trench, it’s no wonder on a Roatan dive you’ll see dolphins and sharks, sea turtles and moray eels, caves and 1000-foot coral walls along with spectacular sea sponges. These waters are one of the best places in the world to see whale sharks especially between May – September. If you are not certified, or it has been a while since you last dove there are a range of PADI dive courses and recreational dives to suit every taste and ability. Courses generally last three to four days with open water certification including two confined-water and two open-water dives. But don’t let the laid back Caribbean lifestyle fool you – this diving mecca offers trained multi lingual dive masters, instructors and 5 star PADI-certified diving companies with all the latest equipment. Without exception all diving is done in the presence of PADI trained professional dive masters and/or instructors. Many of the islands experienced dive masters and instructors were trained under the NAUI system and all world wide certifications are recognized, including NAUI, YMCA etc. Make sure that you bring your certification card for verification. Choose from multi-dive packages (are 10 dives enough for you? ): night dives, shark diving, wreck diving, deep dives and fun dives. Prices vary but generally are between US$250 to US$325 for packaged dives (10) and single tank dives start at approximately US$25. Rental equipment is generally included although most avid divers bring their own gear. Check out the selection of dive operators below for more details. Many of the resorts are located in the Roatan Marine Park, which plays a vital role in protecting the reef surounding the island. All divers are highly encouraged to pay the voluntary user fee of $10 a year or $3 a day which is available at their dive shop or at the marine park office. The money goes towards financing park moorings, patrols, public awareness, etc. 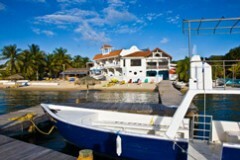 There are many great dive resorts to choose from on Roatan. Whether you are looking for a quaint boutique operation or perhaps you prefer a larger full service facility; you may want to dive some of the more popular dive sites nearer the action, or you may want to venture to the more remote sites and have them all to yourself. No matter what your preference is, there is a dive resort for everyone, Be sure to check out our resort listings below and find your perfect dive resort. There are so many Roatan dive sites that we can’t mention them all here. There are an estimated 176 dive sites around the island with a dvie site for every ability. There are roughly 82 easy sites to 'get your feet wet': 72 advanced sites for a little more excitement: 12 expert sites and 10 technical sites. Suffice to say, you can take a Roatan dive vacation and check out a different site everyday of your stay. Here is a list of some or the more popular dive sites and what one can expect to see. Welcome to one of Roatan's classics, you can't leave without doing this dive! This has something for everyone. We begin in 40ft. of water on a sand chute, home to the shy Yellowhead Jawfish, that takes us down through the "hole in the wall" opening out at 100ft. Novices can ascend a little and enjoy the spectacular wall on the right while the more advanced can descend down the sand slope, leveling out above "the abyss" that drops down to 1000's of feet. Take a right, slowly making your ascent up and along the wall where shoals of Creole Wrasse, Blue Tang thrive. Look out for eagle rays and turtles, and it's not over yet! After swimming for 10mins and upon reaching the top of the wall it's time to head towards the shallows where the 'swiss-cheese' rock formations provide another fabulous journey down, round, up and over swim-throughs, caverns, and canyons while "off-gassing" in 20ft of water. Keep an eye out for marble-eyed Spotted Scorpion Fish lying amongst the rocks on the bottom, and finish off with a visit in the last canyon where Glassy Sweepers and Silversides (seasonal) jostle for the spotlight as the sunbeams through the cracks. For the adrenalin seekers there is a dark and silty cavern at the end of this canyon, which has several passages that one could quite easily get lost in, so of course do not do this without an experienced guide. The view coming out of the canyon is an amazing gradient of greens and blues with silhouetted rock formations. A perfect dive and a perfect profile. Another Roatan classic, this ship was an old beached cargo vessel, 287ft long, bought by Anthony's Key Resort to create an artificial reef. Originally sunk in 1993 only to be smashed into 3 pieces by the mighty Hurricane Mitch in 1998. The Wreck was thoroughly cleaned before it was sunk so there was no environmental impact on the reef, and is perfect for penetration, as there are no obstacles to worry about. We begin by dropping 110ft straight down to the stern and onto the sand where a field of Garden Eels sways back and forth from their little holes. Big Groupers sometimes come right up to your face while laid down watching the Eels. The propeller shaft and stern are raised out of the sand as we plunge head first through a window and into the wheelhouse, causing disorientation as the angle of the boat is twisted. Pockets of air trapped on the ceiling look like pools of liquid mercury as we exit through a beautiful rectangular opening out into the deep blue and toward the middle section. The middle section is not really enclosed but offers a variety of swim-throughs while looking up at the mast piercing the water above. Then it's off towards the bow where you can swim through a doorway, then exit through a large hatch on the bow. Look over the edge and down to a coral patch at the base of the bow that is home to the famous Green Moray Eel that is not afraid of divers. He often comes right up to you looking for food. A pair of Translucent Blue Parrot fish feast on the algae growing on the bow. Groupers and Dog Snapper follow the divers around. Oysters and Clams are prolific all over the boat but sneak up on them or they close too quickly! Often an Eagle Ray comes gliding along the wall as we head to shallower water after about 20mins on the boat. The wall has nice canyon formations and a cavern in 15ft with a roof exit in 5ft that gives shelter to Bristle Worms and Glassy Sweepers. Drift along at 30ft towards Pillar Coral dive site where many fish like Sergeant Majors, Grunts, Blue Tang, Chub and Parrot Fish dance on the top of the wall. A very different dive. Dive through a deep channel that links the lagoon with the outer reef. The channel begins shallow but reaches a maximum depth of 90 feet, and is about 50 feet across at the widest point, but if you look up you will discover what makes this dive so famous. The walls of the channel slowly converge above you, and when they are only a few feet from the surface, the walls are only six feet apart. You can make out a beautiful ribbon of light 80 feet above you. "Spooky" due to the low level of light entering, and the reason for an unusual prominence of low light corals normally found in the very deep. Fascinating rock structures, swim-throughs, lobster and starfish, a truly unforgettable dive. Originally called 'Mary's Crack', a divemaster at Brick Bay Resort discovered and named it after his wife, but had to change it for an article in Scuba Diver magazine a long time ago. This has got to be one of Roatan's most famous dives because of its amazing structure forming this crack inhabited by every type of coral, and sponge. Impressive overhangs teem with colour and life and lots of Seahorses. This site is on the south side of the island, an easy dive fro from any of the south side resorts. Interested in caverns? Then this is the dive for you. At 50ft begin with a beautiful tunnel swim-through, opening out into the blue, and then down and along the wall. A big Plate and Sheet Coral outcrop provides home to many fish, sometimes a group of Squid. Make an ascent to the top of the wall and the entrance to the huge beautiful cavern, Bear's Den, in only 25feet. Look closely at the rocks while approaching the entrance for the tiny Lettuce Leaf Sea Slugs and other Nudibranchs, even a Spotted Drum. Swim over forty feet into "cathedral-like" Bear's Den, where sunbeams scatter shafts of light that dance around on the sandy bottom. Lie on the sand and relax while watching Glassy Sweepers swim back and forth amongst the light beams. Then it's time to head back for yet still more swim-throughs and canyons just past the mooring, keeping a close look at the Gorgonian Soft Corals as they provide shelter for rare Seahorses and Neck Crabs, usually only visible to the trained eye. The cavern is best seen in the mornings, as the sun's angle is perfect for the light beams in full effect. Famous for its perfect profile for snorkelers and divers, it is in fact a channel that starts from the inner part of the reef and flows out towards the coral ridge, starting at 10ft and then to 45ft at the top of the wall. Start on the wall, barrel sponges, interesting tiny coral heads cover the deep sandy slope that look like an army of strange mushrooms. Then head yet again toward the shallow water where a series of canyons in 20ft of water provide home to a large Porcupine Fish, Glassy Sweepers, Moray Eels and in mid-June to early August shoals of Silversides fill the canyons sometimes making it impossible to see which way one is going. After exiting the last swim-through, dancing with, and scattering the tiny fish, it's time to follow the channel. Either side goes right up the surface guiding you to the outside of the reef and turtle grass in 10 ft where the boat can meet you, another perfect dive profile. Magical formations of corals and sponges and sloping white sand give this place a dream-like quality like no other site on Roatan. Like the name says there is a Garden of Eels down at about 65ft. Huge white shallow sand patches make it ideal for students on their first dive and it's perfect for snorkeling as the top of the wall is only 20ft. A shear wall, healthy coral, huge schools of fish and good chances of seeing Eagle Rays and other large pelagics. If you catch it just right with a nice current it can be a spectacular drift dive, flying in formation with your buddy just enjoying the ride. Off in the distance you may just catch o glimps of the sunken 'Josie J'. Why? Because " everything is so huge " said Mickey, an instructor at West End Divers and well the name just stuck. This is UNSPOILT BEAUTY at it's best. Huge Barrel Sponges, some big enough to hide inside are scattered everywhere across the plains of Texas and glorious corals housing every type of Caribbean reef fish like the Queen Triggerfish and Black Durgon. Rare fish like the Atlantic Spade Fish and the Sargassum Triggerfish can be found amongst these coral patches, but be discreet because they are shy fish that dart back into their holes if they see you coming. Usually there is a wonderful current that runs east to west making it perfect to glide across the plains at ease at 50 ft. The actual wall top at Texas is quite deep at 100ft and beyond, and then it's sometimes difficult to work your way shallower against the current. Anyone can enjoy the plains of Texas but right out on the wall calls for a little more experience. The place for BIG Groupers, a beautiful wall, teeming with Creole Wrasse and always at least four BIG groupers and sometimes even bigger Dog Snapper. Perfect for close-up photography of these gentle giants. The reef offers interesting formations and sandy patches around about 45ft and on the wall there are canyons and over hangs. This site offers a unique feature, an ancient waterfall, giving a glimps of what the island would have been like during the last ice age when the sea level was much lower than it is today. Free swimming Moray Eel and Eagle Rays may be seen. This is just a tiny sample of the enormous number of truly outstanding dive sites on Roatan. Check out the Roatan Marine Park site for a complete listing of the dive sites on the island, but the only way to really experience the magnificent diving here is to come try it for yourself!